The St Bedes Unit is a bed and double wardrobe combination. The bed base includes two central drawers and two cupboards. One cupboard includes a secondary secure door for storing valuables. The wardrobe acts as a headboard, including 2 small inset shelves, pigeon hole shelving and a hanging rail. This bed is of medium height, and is attached to a double wardrobe. The wardrobe acts as a headboard for the bed whilst also providing 2 small inset shelves. 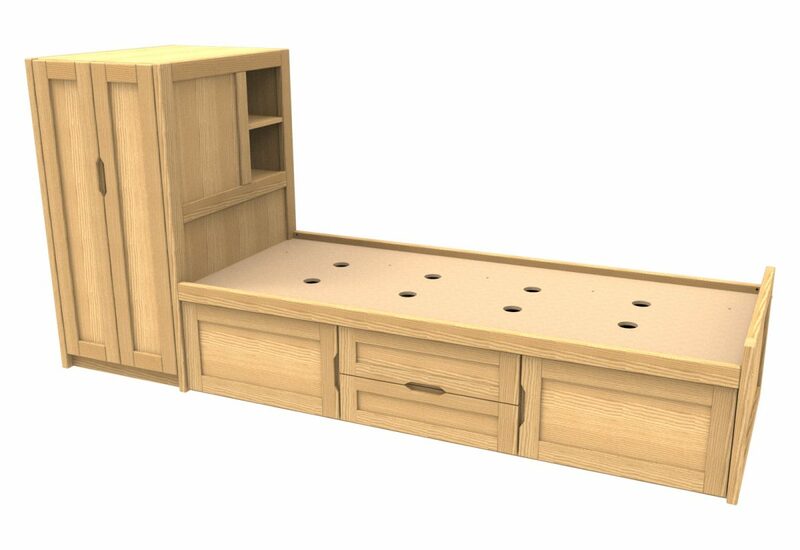 The bed base incorporates 2 central drawers and 2 cupboards, ideal for students, one cupboard includes a secondary secure door for storing valuables. The wardrobe within the unit includes hanging space and pigeon hole shelving with a laminate top. The external panels and drawer fronts of this bed are manufactured using solid ash hardwood and ash veneer. The drawers are ran on wooden runners however alternate runners can be supplied if required. As with all of our beds, many internal items are made using MDF, including an MDF bed base provided with ventilation holes. The standard finish for this bed is clear lacquer, however alternate finishes and paints are available upon quotation.